The Emerson In has a new restaurant. 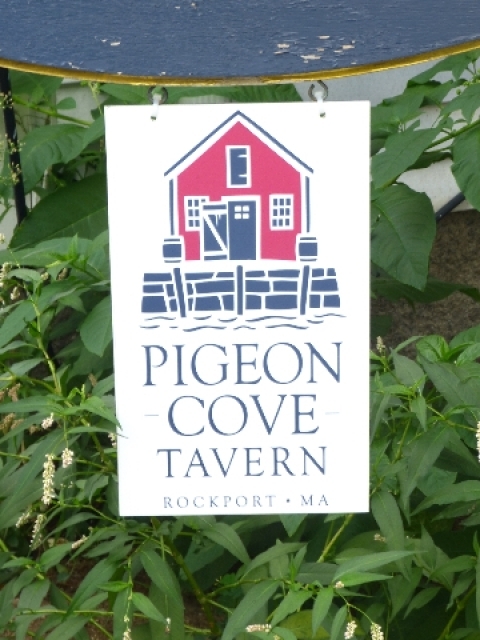 The restaurant is not far from scenic Rockport. View of the Atlantic from the terrace. We split the order of salad. 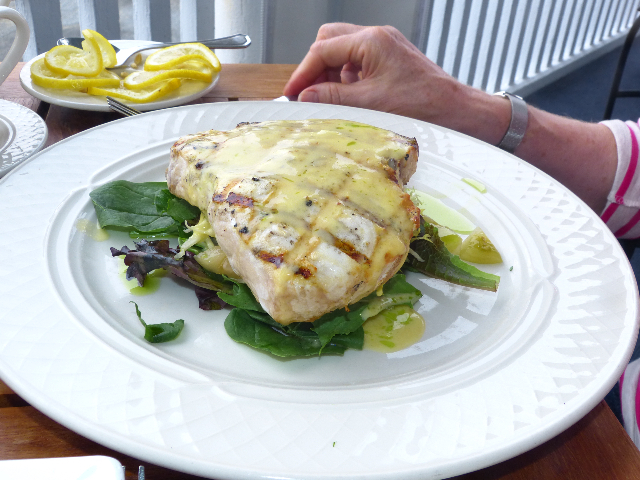 The sword fish was cooked perfectly. The duck proved to be an excellent choice. A detail of the layers of duc k breast on that intriguing bed of ingredients. Our busy week was mostly taken up with family and friends. There was only one night, Thursday, for a special occasion dining experience. Our host at the Gloucester Writers Center, the filmmaker Henry Ferrini, strongly recommended Duckworth. We called for a reservation but were told that the evening was booked. Not even for an early bird visit it seemed. My cousin Kevin confirmed that you have to reserve weeks ahead as he did for an anniversary evening with Tony. 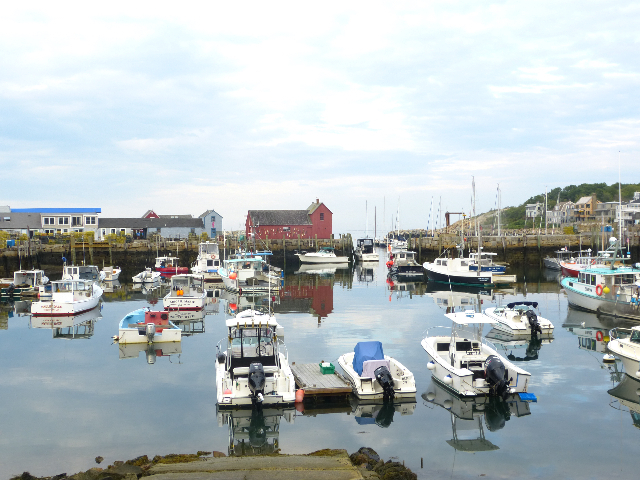 That afternoon we headed for Rockport to visit the library as part of our research. I had hoped for the Peg Leg a favorite growing up but it has closed. Feeding the meter we explored and even visited sinful Tucks where as a kid I always bought some fudge. They still sell it and have another factory/ shop in Dock Square. There was an entrance to the beach down steep granite steps. Unlike Gloucester there was no charge if you can find a place to park. The beach was grand as we sucked up the salt air. We called Pip to talk about my reading the night before. Casually I asked if there was a place to dine in touristy Rockport. “Sure” she responded. 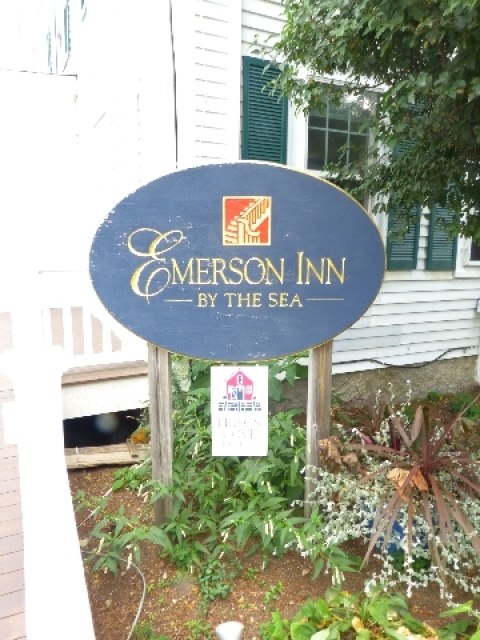 “People have been raving about the new restaurant at the Emerson Inn outside of Rockport on the road back to Annisquam. It’s past the old tool factory. 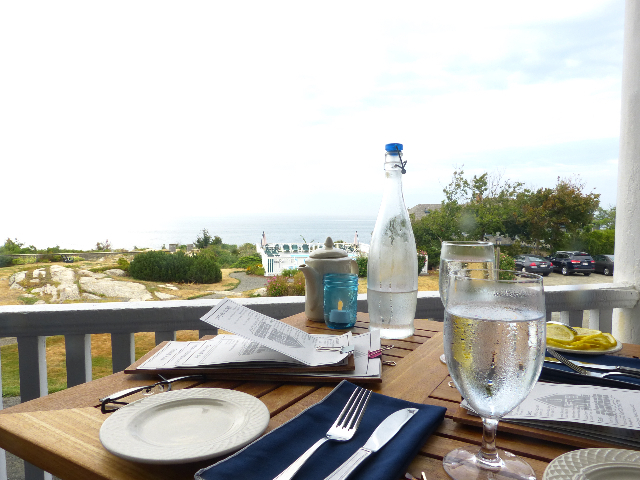 It was about six when we arrived and the terrace, with a magnificent ocean view, was sparsely populated. It would be full by the time we left. Astrid had been hoping for seafood and there were just a couple of items including scallops and salmon to which she is allergic. She settled on sword fish and had specific instructions to the chef on how she wanted it prepared. 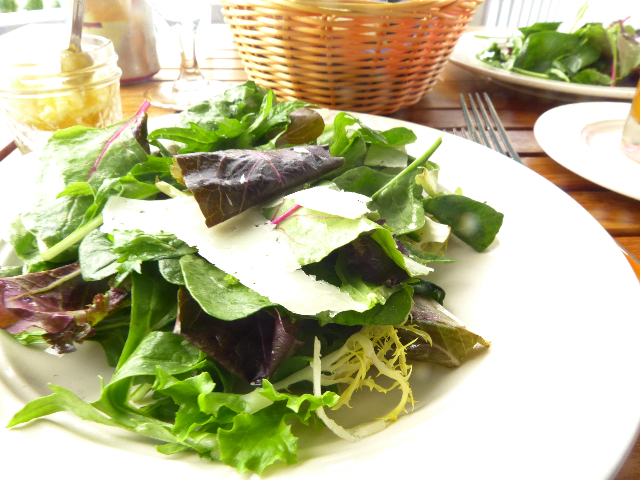 The serving was truly faultless as it was perfectly cooked, fresh and moist. The house made pickles under it were less to her liking but I found them intriguing particularly the bits of pickled fennel. I was in a bit of a quandary. It was a tough choice between a pork chop and roast duck. While duck is a favorite too often it is disappointing. I asked for details and a recommendation. The response was so enthusiastic I gave it a go. My goodness. 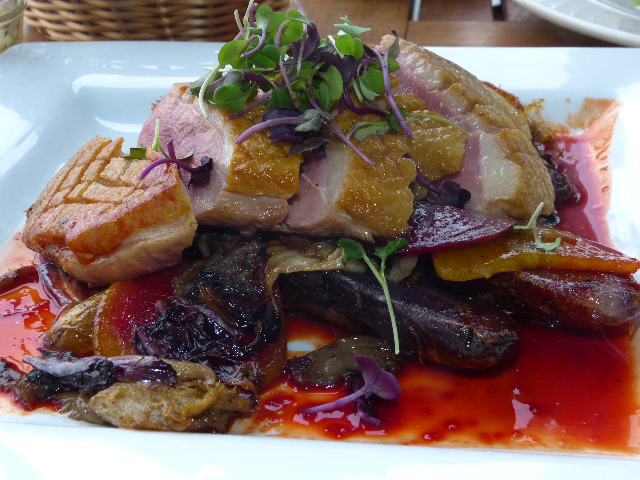 It was one of the most interesting, flavorful, exotic and unique duck dishes I have ever eaten. Instead of the usual sweet sauce the breast was sliced with a generous portion layered over an enticing mound that invited critical analysis. This was not a dish one would likely try at home. It was far too complex. 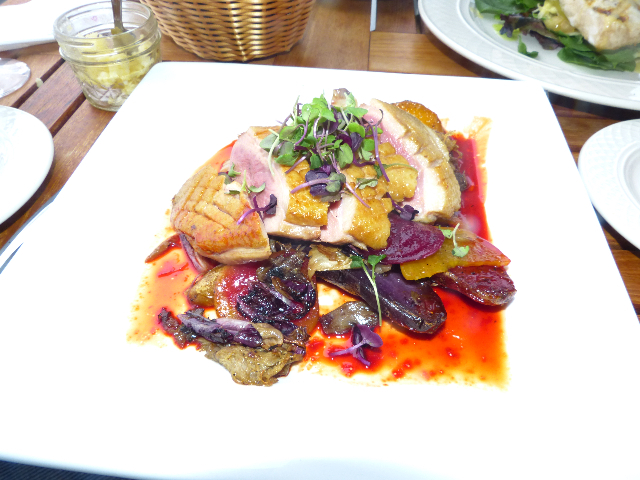 There was a mix of shredded duck confit mixed with beets done perfectly and accents of radiccio. Some of the slices had been cooked in duck fat. Just for one night it was best not to dwell on cholesterol. As they say if you must eat duck let the fat run down your chin.